This month is full of opportunities to give back, network, and grow professionally! We’ve also released a Mid-Year Executive Report highlighting our activities in the first half of the year as well as progress towards our fundraising goals! Check out the report here! Keep reading to view our calendar of upcoming events and find out more information on each of them. 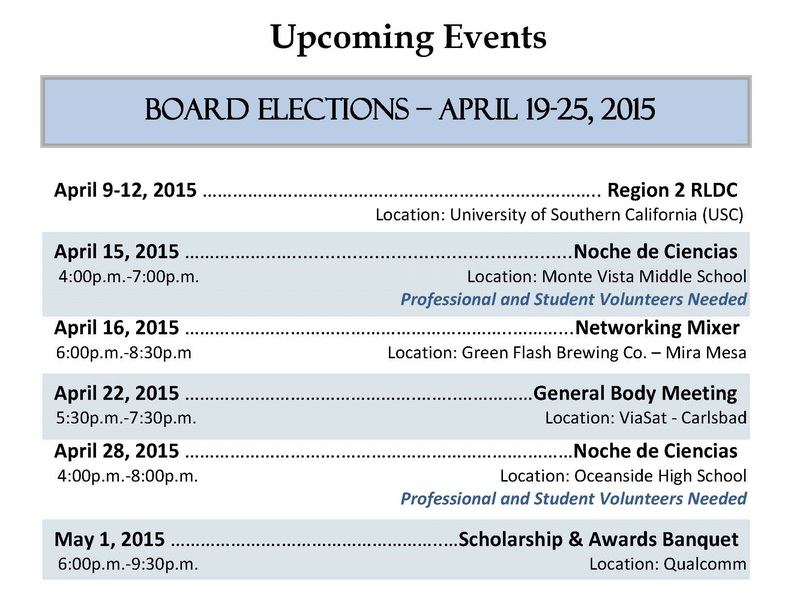 Annual Elections: Nominations for 2nd VP, Treasurer, and Secretary are open now until 4/17! Come to our Green Flash Mixer to find out more from our current board and visit the Annual Elections page for more info on board and chairman positions. Region 2 RLDC: Region 2’s Leadership Development Conference is this week and there are still a few spots available to attend! This year’s conference will be held in Los Angeles at the USC campus. Visit the conference web page for the Student, Professional, and High School Track Agendas and Registration! Note that the Saturday high school track is open to all high school students and is free! April GBM & Tour: Our last GBM and Tour will be held at ViaSat on 4/22! Come learn about ViaSat and find out more about our student chapters. More info here. Green Flash Brewery Mixer: Come network, meet other SHPE members, and find out more about board positions at our professionals only April Mixer at Green Flash Brewery on 6550 Mira Mesa Blvd, San Diego, California 92121 from 6 to 8:30 PM! More event info on our Facebook page. Annual Banquet: Early bird tickets are on sale now through 4/25 for SHPE San Diego’s 33rd Annual Scholarships and Awards Banquet! Join us in celebrating this year’s achievements and scholarship recipients! Noche de Ciencias East County: Spread the word and volunteer for SHPE Noche de Ciencias at Monte Vista High School in Spring Valley on 4/15! This Noche is sponsored by Cuyamaca College, Monte Vista SHPE Jr., and San Diego Gas & Electric. Click for more information! Download the English flyer here and Spanish flyer here! Noche de Ciencias North County: Oceanside High School will be hosting their 2nd Noche de Ciencias on 4/28! Spread the word and sign up to volunteer! This Noche is sponsored by SHPE San Diego, Oceanside SHPE Jr., and SHPE Foundation. Click for more information!